There isn't a person you wouldn't love if you could read their story. I tend to try and not speak in absolutes and there may or may not be some exceptions to this rule, but the point is an obvious one: all the races and people with different sexual orientations or different religious beliefs can get along once we really get to know one another; that we're not really all that different after all. That's all well and good, but it's also a tried and true formula that at least one Hollywood production trots out every awards season to try and make us all feel better about ourselves. One might think, given the current cultural climate, that any movie attempting to bring people together might immediately be dismissed as one party's agenda to corrupt another into actually having a conversation with a person of opposing views, but maybe that's ultimately why Green Book feels so good right now and ironically, so needed. There isn't a damn thing here you haven't heard or seen before and director Peter Farrelly (one half of the brother directing duo who brought us comedy classics like Dumb & Dumber and There's Something About Mary, but also brought us Dumb & Dumber To and The Heartbreak Kid) directs with the eye of about as mainstream a filmmaker as it gets meaning there is nothing glaringly unique or interesting about the way in which he captures these events, but this does mean it will undoubtedly speak to a very large audience. There was some slight hope that Farrelly might utilize his experience in his years of making broad studio comedies to infuse the many predictable formulas this movie utilizes with a more striking tone or presence, but while taking on a project like this might have been a bold thing for the filmmaker to do given his past credits he alas decides to do nothing bold in the execution of this change in pace, but instead plays it right down the middle. Fortunately for Farrelly, the story has such a great inherent hook and given he's hired two more than capable talents to lead his film it hardly matters how he's saying what he wants to say as long as it's competent enough to capture how Mahershala Ali and Viggo Mortensen are saying what they want to say. It's largely through these two performers that Green Book transcends the calculations of a movie such as itself, eclipsing every predictable note it plays that could have so easily rung false to become something genuinely endearing; a true crowd-pleaser in the least cynical and most delightful of ways. Dolores Vallelonga (Linda Cardellini) tells her husband, Tony (Viggo Mortensen), by as he embarks on a 8-week trip through the south. Maybe the most educational thing to come out of Green Book is not how much we can learn about ourselves or how alike we are when we set aside our differences though, but rather it is the inspiration for the title and what an actual green book is. This explanation or definition comes into play when Dr. Don Shirley (Ali), a virtuoso pianist who also happens to be black, decides to embark on a tour of the deep "Jim Crow" south in 1962, and hires a white, Italian man by the name of Tony Vallelonga or "Tony Lip" (Mortensen) who has a reputation for being something of a brute to serve as his road manager and bodyguard while on tour. Prior to leaving New York, where both men call home-though Tony is from the Bronx and Shirley lives above Carnegie Hall-Tony is handed what is known as a "green book" by Shirley's record label exec (P.J. Byrne) who tells him it is a guide for black travelers to find safe havens throughout the South. Having no idea this facet of the civil rights movement even existed despite making complete logical sense, it only serves to emphasize the nature of the country at this point in time. This stark contrast between the civility Shirley is greeted with at each of his engagements throughout the south and what it actually takes to survive this road trip (i.e. the green book) lends a great amount to how this core friendship eventually comes to be. It is this friendship that is obviously the heart of the film meaning screenwriters Nick Vallelonga (Tony's real-life son) and Brian Hayes Currie along with Farrelly (who gets a co-writing credit) know well enough to develop said friendship with as much intuition as they do craft. Now, given Vallelonga had tapes of interviews with both his father and Dr. Shirley giving their perspective on these events to draw from it's easy to imagine writing a film like this wouldn't amount to much of a task, but while the material may have been more than sufficient it is the act of boiling all of that material down into a three act structure that both makes sense and conveys the proper arcs for its two primary characters that is the difficult part. 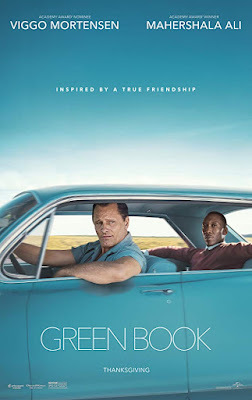 As one might guess based on the previous paragraph, Green Book largely uses tropes from odd couple and road trip movies where we know that despite the fact these two guys don't get along in the beginning that by the time they get back home they'll no doubt be the best of buddies-a part of one another's lives for the rest of their lives. Throwing two guys together who are more or less complete opposites and forcing them to work out their differences is a premise that has been used countless times, but it's how well the dynamic is sold between the two actors that makes it work or not and both Ali and Mortensen show up for work here. It also doesn't hurt that the film avoids the one trope where our odd couple experiences a single moment, bond or share a big laugh over it, and then are friends from that point on. 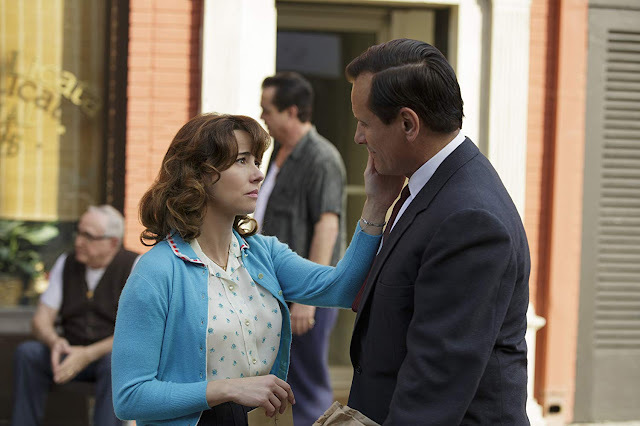 Green Book doesn't rush the connection, but allows it to play out in a more believable manner so that, by the end of the film, we firmly believe in the final scene that we knew would be the final scene from the moment Tony took the job offer from Dr. Shirley. Shirley is a refined, but complicated man who speaks eight languages and was the first African-American admitted to the Leningrad Conservatory in Saint Petersburg, Russia at the age of nine. Tony, on the other hand, is a tough-guy bouncer who worked as a maître d’ and supervisor at the Copacabana club, starting in 1961. It is when the Copa is set to close for two months due to renovations and Tony is out of a job and looking for work to temporarily replace his income that he is referred to Dr. Shirley as someone who might be a good fit to help protect him on this trip through the south. The catch is, Tony's something of a racist himself as demonstrated early in the film when Tony's wife, Dolores (Linda Cardellini), hires two black guys to help fix their molding kitchen floor and who Tony sees fit to not drink after given he throws away the glasses they use after Dolores offers them a drink. Smartly, the film doesn't make Shirley completely likable either as he consistently talks down to and hurls intellectual insults at Tony that Tony is sometimes too dumb to even recognize are insults. It is the evolution of both of the characters that comes to serve the main idea that while each of them come to learn a lot from the other and have undoubtedly changed over the course of this journey the key is that they understand one another more while still being two distinctly different people. They talk, their guards drop, they connect, and we see the humanity in each of these individuals. Ali playing up the eccentricities and duality of what being a black man at this point in America must have felt like, especially a black man in Dr. Shirley's unique set of circumstances who somewhat amounts to the harmless black guy that always preaches non-violence so as to not scare off us white folk. Meanwhile, Mortensen somehow manages to play up the most extreme stereotypes to a point so far gone that it somehow wraps itself around back into, if not the truth, at least something that feels authentic. Tony is coached by new pal, Dr. Don Shirley (Mahershala Ali), in the art of letter writing in Green Book. 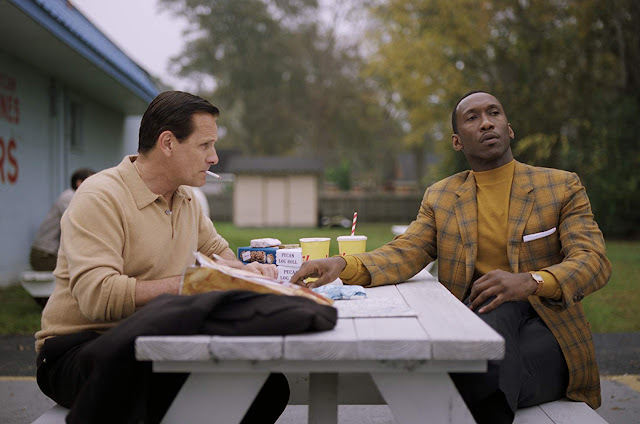 Admittedly, Green Book is almost formulaic to the point of being offensive and it's not difficult to understand why certain audiences or critics would in fact be offended by the stereotypes and clichés running rampant in this thing. It's not difficult to understand not only why some, more seasoned viewers, may be turned off by what is admittedly a rather toothless endeavor on the surface, but to try and convince myself that what I experienced wasn't genuinely effective or didn't move me with some force simply because of the familiarity through which it played and the predictably sappy archetypes in which it plays upon would be a lie; in all honesty, I was grinning through my teeth by the time that inevitable final scene came around and these now devoted characters with somewhat disparate souls were all brought onto the same page with just the right amount of understanding between them. It was pure cinematic gold and I bought every ounce of it. Needless to say, there is much to like about Green Book, but what is so endearing about the film in particular is that it is able to breathe new life and real heart into the clichés and stereotypes that might come across as insulting on the surface. The characters are fully realized and we know this because, despite neither of them being particularly likable, we still enjoy spending time with them in the car while actively listening to their bickering; we may or may not have been friends with either or both of them in real life, but they are entertaining to watch regardless. Furthermore, both Tony and Dr. Shirley find themselves in situations that, if one has ever seen a period piece dealing in race, can be seen coming from a mile away and whether one knows the true story or not prior to walking in one can probably guess how things will turn out, but despite even this there is a sense of alarm when these characters find themselves in dire circumstances. We, the viewers, find ourselves rooting for these characters because we care and know that, above everything else these two may have differences over or disagree on, that they have each other's back. Factor in the strong humor that is nestled into the drama, the musical performances and score from Kris Bowers, and the fact it highlights a new aspect of this terrifying chapter in history (in addition to the titular book the film also highlights sundown towns which, if you'll excuse my ignorance, was something I was unaware of existed prior) that help lend it the feeling of having this very dark, very serious subject matter (which it is), but still operating as largely hopeful. There is a stigma of sorts that only heavy dramas warrant the highest praises, but sometimes (or most times) it's nice to walk out of a movie that wants to make you feel good and Green Book accomplishes as much not necessarily with exception, but with ample amounts of charm.